Serious food allergies are becoming more and more commonplace today, affecting 1 in 13 children. This infographic from Food Allergy Research & Education (FARE) offers a snapshot of food allergy facts. That is why there is a movement for schools to stock epipens as a precaution for undiagnosed children as you cannot know a child has an allergy until they eat the food for the first time. And children can develop food allergies to foods they have already eaten. If you think your child has a food allergy, see a pediatric allergist and get their advice especially on what foods your child should never have at all and if there are foods they should avoid. Be sure to tell your pediatrician and any other medical practitioners. If you have other children, ask your allergist about any precautions you should take with their diet even if they haven’t shown signs of allergies yet. We found out the hard way that our younger son is also anaphylactically allergic to pistachios as well as cashews. He is much more adventurous with food than our older son so the potential for him discovering new foods that he could have issues with was higher. We’d never encountered a situation with cashews with my older son since he preferred a pretty simple, typical young child’s diet. Check out reputable resources like the Asthma and Allergy Foundation of America and Food Allergy Research & Education (FARE). Share experiences with other parents dealing with food allergies through online forums. Have a polite, respectful discussion with your child’s care provider, preschool or school before each school year begins to make sure it is very clear what foods they should never have and how to determine that. Never assume that because you had the discussion a year ago and your child is attending the same school that you do not need to have the discussion again for the next school year. Personnel and teachers change and you wouldn’t want the seriousness of the situation to slip anyone’s mind. Be sure your school or provider has any medication (i.e. Benadryl, Epipen) and your official food allergy action plan documentation (such as this one) signed by your allergist before leaving your child alone with them. If your child spends any significant time anywhere without you (such as religious school), be sure they have an epipen and action plan as well. If your child has other conditions like asthma that could make resolving an allergic reaction more complicated, ask questions and be sure your allergy plan reflects them. In an emergency staff are likely to give emergency medical staff your allergy action plan. 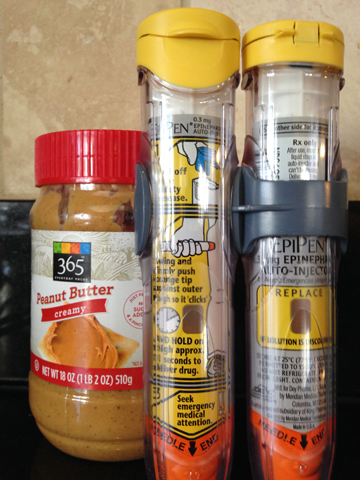 Does your allergy plan indicate that they are to call 911 immediately after administering the first Epipen? Make sure to verbally review with any caregivers the instructions and remind them to administer the Epipen, call 911 and then call you immediately after so you can meet them at the hospital. Ensure that there is always someone present who is trained to administer the Epipen. You do not want someone figuring out what to do in an emergency situation, they need to practice. Most Epipens come with an extra “Epipen trainer” that is not a shot, but most facilities will also have practice drills with staff. Make sure it is clear how food is handled in the classroom, lunch room, and outdoor play areas. For any food that the school or facility provides, determine if your child can eat their food safely or if you always need to provide your own. Consider asking the caregiver or teacher if you could provide a small supply of safe treats for your child just in case someone brings in something that doesn’t seem safe for your child. Unplanned situations can arise and we found it easiest to have some simple treats stashed to avoid unnecessary challenges or hurt feelings. Be careful when going to family and friends’ homes. Be sure to share with anyone close to you your child’s allergy situation and the risk involved. In my experience, some friends and family will be super careful; others will not be. Some family members who we do not see regularly forget which can be risky when your children are young and the risky food is left out in open bowls. Never leave your child at someone’s house for a play date for the first time without letting them know about the allergy. Explain why your child needs the food restriction so that the parents understand and can be sympathetic. Provide a detailed list of what includes the allergan, any other names it might be called, and ideas for safe, child-friendly substitutes. For example, not everyone might know that tahini contains sesame seeds. Try to balance what you ask of other parents weighed against your child’s safety and feelings. For example, if your child is anaphylactically allergic to peanuts it seems reasonable to ask that a birthday cake for your child’s class only be provided if the parent or teacher knows without a doubt that it is nut-free. However, it might not be fair to place rules on another classroom in a different part of the building not next to your child’s. Or to ask parents to not bring any nut products to any of the public playgrounds in your city – why not ask if they could make one playground nut-free instead. Weigh what you ask for an allergy that results in a relatively mild incident such as a small rash vs. an anaphylactic allergy. Find opportunities to thank the teachers, administrators, caregivers, and other parents for their patience with the food restrictions and helping to make it easier for your child. That you appreciate their protecting your child and that it might inconvenience them. Share ideas for healthy alternatives that are likely to appeal to kids. If you’re a teacher or a parent of a child who does not have a serious food allergy, thank you for your patience. We know it’s not easy to get kids to eat healthy food, so further limiting your choices if your child is in a nut-free or otherwise food restricted environment can be a challenge. Thank you for taking the safety of our children who are allergic seriously. If you have never used an Epipen, practice! You don’t want to find yourself in a panic in an emergency situation first learning how to use it. As a Mom I panicked a couple of times when I was in the situation, but had to pull it together to save my son’s life. Much easier if you’ve done it before. Ensure room parents, substitutes and anyone else walking into your classroom know you have a child with life threatening allergies. Never assume because you sent out some emails or handed out a flyer that everyone knows. Everyone is so busy, they need to hear it a few times in different ways, and especially if it’s someone who has not brought food into the classroom before. Do not allow those foods in the classroom especially through elementary school years, the risk is not worth it. Try to avoid phrases that might make a parent feel bad or like they are imposing too much on you. Food allergies are not anyone’s fault, they cannot be “healed” or changed, and can have dire consequences. Be sympathetic and ask appropriate questions if there is something you are unsure of, especially if it could involve the child’s health. Check with your administrator if you aren’t sure of school policy and if staff will be doing practice drills. Check out resources like http://www.foodallergy.org/resources/schools.